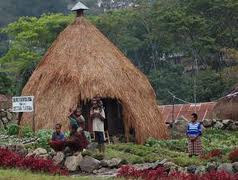 Honai is a typical house in the central highlands of Papua which is inhabited by a tribe Damal; tribe Dani; tribe Moni; tribe Me; and relatives of other tribes in Papua. Honai houses made of wood with a conical roof made of straw or reeds. Honai has a small door and have small windows, these windows serve to emit light into enclosed spaces, there is also honai who do not have to honai jendala women in general. Honai structure built narrow or small in order to withstand the cold mountains. Inside this honai they put up a campfire in the tenga-tenga in order to warm their bodies at night. Hi Tonggoi is Honai for men. 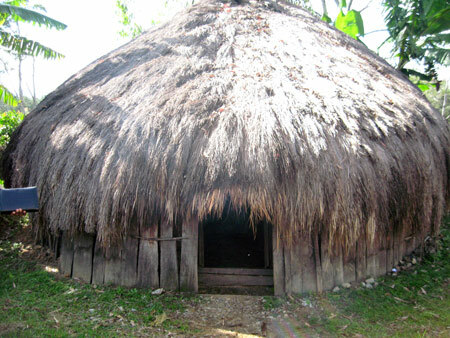 Made larger in order to accommodate all men, whether traveling or heads of families in one village. Inside this tonggoi hi men mamasang bonfire in the middle and talk about life today and the future. Parents gather in honai His sons, and every night to teach them many things about the norms prevailing in society, and many things discussed in this honai. Hi Onggoi is Honai women. In honai specifically for women Mothers and daughters only, the form of rather small honainya within their family size. Boe Nai is Pig Cage. Honai was built just for maintenance pigs.